The first Patriarch after the Fall, Gennadios Scholarios, reassembled the old Academy of Byzantium, which evolved into a School. It is the current Patriarchal Great School of the Nation, the oldest Educational Institution of our Nation. The first Director of the School of the Nation was Matheos Kamariotis. After the creation of the Patriarchal Great School of the Nation, the Metropolitans and Bishops of the Throne undertook establishing schools in their provinces. Apart from the City, schools that were under the supervision of the Church and the Patriarchate in general, were founded in Dimitsana, Smyrna, Adrianople, Thessaloniki, Ainos, Stenimachos, Saranta Ekklesia, Patmos, Gallipoli, Ioannina, and other places. All of these actions are due of course to the Holy and Sacred Synod of our Patriarchate, during the Patriarchate of Jeremiah II the Tranos (1572-1579; 1580-1584; 1587-1595). Indeed, the decision of the Synod stated: "It has been decided that each Bishop will be given the opportunity to create under their care and expense a community, to be able to teach divine and sacred letters." The primary feature of these schools was learning the Greek language. This was done mainly through ecclesiastical books, without excluding others such as ancient Greek writers, and the teaching of Greek history. After the 17th - 18th century, when the economy was better, the Church again led in the establishment of schools. At that time Athoniada Ecclesiastical Academy was established by the Sacred Monastery of Vatopaidi, which operates until today on Mount Athos. The Sacred Monasteries of Vatopaidi, Xeropotamou and Pantocratoros of Mount Athos, strengthened financially the School in Ierissos giving 208 piastres, 15 Turkish lira and 182 piastres. The Castle-Monastery of Patmos established the Patmiada Ecclesiastical School, which also operates until today, while a school was also established in the Sacred Monastery of Saint Anastasia in Vasilika of Halkidiki, which is currently closed. The invention of printing certainly did not leave the Church without an impression. Patriarch Cyril Loukaris (1612; 1620-1623; 1623-1633; 1633-1634) established a printing press at the Patriarchate, but unfortunately his unjust and cruel death abruptly stopped this endeavor. The Monasteries of Mount Athos, Saint Anastasia, Saint Dionysios of Olympus, Patmos, Meteora and others, became a gathering place of many manuscripts of classical authors, as well as the Fathers of the Church. Important ecclesiastical men of those years, who either studied in those schools or taught in them, or established them, were Ecumenical Patriarchs Gennadios Scholarios, Cyril Loukaris, Samuel Hantzeris, and Gregory V, the Patriarchs of Jerusalem Anthimos and Dositheos, and other Bishops like Daniel the Elder of Ephesus and Ignatios of Wallachia, the Archimandrite Gregory Sifnios, the Monk Saints Nikodemos the Hagiorite, Kosmas Aitolos, Maximos the Greek, Eugenios Giannoulis, Eugenios Aitolos, the Monk Agapios Landos (1600-1670), the Great Clerical Preacher of the Great Church Agapios Leonardos and others. The two important Sultanic Firmans, the Hatt (Edict) of Serif of Gülhane decreed in 1839 and the Hatt (Edict) of Humayun in 1856 by Sultan Abdülmecid I (1839-1876), gave another boost in education. 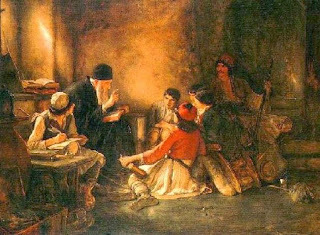 In the area of Thessaloniki alone there operated ten Greek schools, from the area of Agiou Athanasiou on the Egnatia to the Sacred Monastery of Vlatadon, with 2200 students and 44 teachers. The maintenance of these schools was through the candle offerings of the churches, bequests, and gifts from the trays, while in Sanzakis in Serres the school operated under the supervision of Metropolitan Matthew of Serres in which the famous Constantine Oikonomos of the Oikonomoi taught, and there was imposed a tax on every load of cotton. The offering of the Church in those years was great and certainly in one article it all can't be analyzed. The importance of this work was illustrated by the saying of the late great politician and academic Panagiotis Kanellopoulos, who stated the following regarding the offering of the clergy to education especially in the area of our Macedonia: "Fortunately many ran. But there would not have existed a place where they could have ran, if education and the Church failed, before 1903, to keep the land of Macedonia Greek, and able to receive and later embrace the more than six hundred thousand refugees, who were uprooted from the other ancient centers of Hellenism."